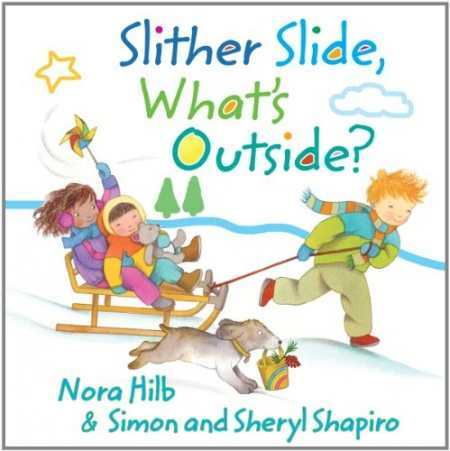 Parents, caregivers, and teachers will immediately warm to the plethora of concepts—from animals and seasons to rhymes and adjectives—that Slither Slide, What’s Outside? offers their young children. Preschoolers, however, will simply see this attractive package as part of their quest to explore the natural world around them. Depicting a variety of kids at play, indoors and out, this inventive book starts with them planting a seedling in spring and progresses through the seasons as they splash in a summer rain to beat the heat, scoop out pumpkins to make jack-o’-lanterns, and skate across a frozen pond. The book consists of a series of double-page spreads. On one side, active children adorably rendered in gentle watercolors are featured along with a rhythmic, rhyming, alliterative text that bursts with energy (“Bouncing and bounding/ right over the log. / Long legs are leaping—it must be a frog. / Croak!”). The combination of rollicking play and action-packed text will inspire young readers to get up and move along with the words. Readers will also respond to the corresponding pages, with related, full-color photographs of nature outlined in pastel borders. These large, crisp, photographs sport such traditionally beautiful images as a forest rain, a waterfall, a rainbow, and ice-covered branches, plus lesser-known but equally engaging wind turbines and a snow plow. Other pictures include a brown bear, a frog, flying geese, and a red worm. Many of the photographs depict their subjects up close and in enough detail for children to witness a pool’s ripples, a pumpkin’s ridges, a bear’s whiskers, a frog’s spots, and even the insides of the translucent red worm. Authors Simon and Sheryl Shapiro are also the creators of the children’s poetry compilation Better Together. Nora Hilb, who specializes in illustration for very young children, has contributed to numerous award-winning children’s picture books, including Wiggle Giggle Tickle Train and Leo’s Tree. Together this trio’s effort piques young readers’ imaginations and makes learning easy, accessible, and, above all, fun.